Every time you eat, your blood sugar rises. As a result, your body releases a hormone called insulin that helps bring your blood sugar back down. However, in people with type 2 diabetes, the body doesn’t use insulin properly. Your blood sugar and insulin levels will remain high for hours after you eat, which can damage cells throughout your body. Insulin sensitivity is your body’s ability to use insulin correctly. For up to 24 hours after exercise, your body is better able to use insulin, which means your blood sugar will stay lower than if you had not exercised at all. Health experts recommend 150 minutes of moderate activity per week. By exercising 30 minutes per day, 5 days per week, you can be more sensitive to insulin almost the entire week. Recommended moderate activities include walking quickly or jogging, swimming laps, or bicycling. You don’t need to do strenuous exercise to see the positive effect on your insulin sensitivity; you just need to exercise regularly. As your muscles are pumping and moving, they are able to use up blood sugar for energy. Even if you don’t have a lot of insulin in your blood at the time, your body can use up more blood sugar during exercise. You only experience this effect when your body is actively moving and exercising. A regular workout routine can help you lose weight. Losing weight is closely associated with better blood sugar levels. In some people with diabetes, losing weight can even reverse the condition and help them reduce how much medicine they take. Before you begin any exercise routine, you should talk to your doctor about what is safe for you. People who take insulin may be at a higher risk for low blood sugar during exercise. You should also carefully monitor your blood sugar during exercise. 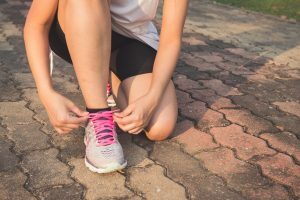 Check your blood glucose before exercise, every 15 minutes during exercise, and after exercise to learn how different activities affect your body. If your blood sugar drops too low, you may need to eat around 15 grams of carbohydrates to help bring it back up to safe levels. You should also avoid skipping meals, as this can cause your blood sugar to drop too low. Remember, you don’t need to take part in strenuous activity to see the benefits of exercise. Moderate activity is enough to help you gain better control of your blood sugar. Physical therapists and registered dietitians at Bon Secours can help you develop a regular workout routine and personalized nutrition plan to help lower your blood sugar. Contact us today to learn more.